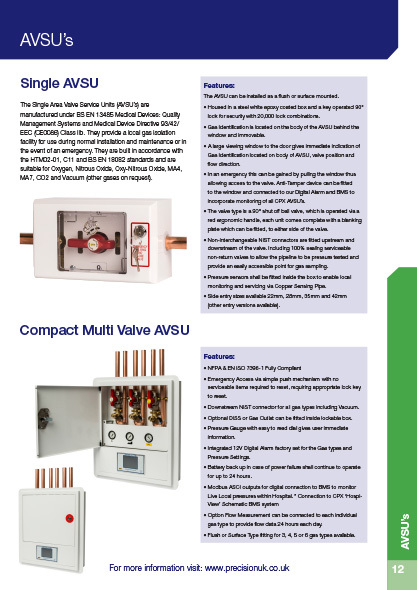 The Single Area Valve Service Units (AVSU’s) are manufactured under BS EN 13485 Medical Devices: Quality Management Systems and Medical Device Directive 93/42/EEC (CE0086) Class IIb. They provide a local gas isolation facility for use during normal installation and maintenance or in the event of an emergency. They are built in accordance with the HTM02-01, C11 and BS EN 18082 standards and are suitable for Oxygen, Nitrous Oxide, Oxy-Nitrous Oxide, MA4, MA7, CO2 and Vacuum (other gases on request). The AVSU can be installed as a flush or surface mounted. 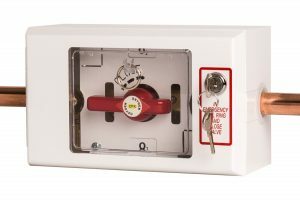 Housed in a steel white epoxy coated box and a key operated 90° lock for security with 20,000 lock combinations. Gas Identification is located on the body of the AVSU behind the window and immovable. A large viewing window to the door gives immediate indication of Gas Identification located on body of AVSU, valve position and flow direction. In an emergency this can be gained by pulling the window thus allowing access to the valve. Anti-Tamper device can be fitted to the window and connected to our Digital Alarm and BMS to incorporate monitoring of all CPX AVSU’s. The valve type is a 90° shut off ball valve, which is operated via a red ergonomic handle, each unit comes complete with a blanking plate which can be fitted, to either side of the valve. Non-interchangeable NIST connectors are fitted upstream and downstream of the valve. Including 100% sealing serviceable non-return valves to allow the pipeline to be pressure tested and provide an easily accessible point for gas sampling. Pressure sensors shall be fitted inside the box to enable local monitoring and servicing via Copper Sensing Pipe. Side entry sizes available 22mm, 28mm, 35mm and 42mm (other entry versions available). Emergency Access via simple push mechanism with no serviceable items required to reset, requiring appropriate lock key to reset. Downstream NIST connector for all gas types including Vacuum. 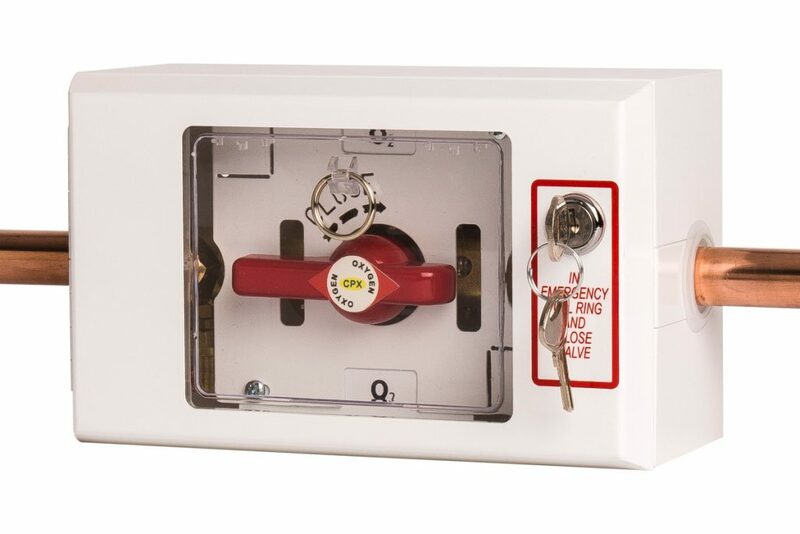 Optional DISS or Gas Outlet can be fitted inside lockable box. Pressure Gauge with easy to read dial gives user immediate information. Integrated 12V Digital Alarm factory set for the Gas types and Pressure Settings. Battery back up in case of power failure shall continue to operate for up to 24 hours. 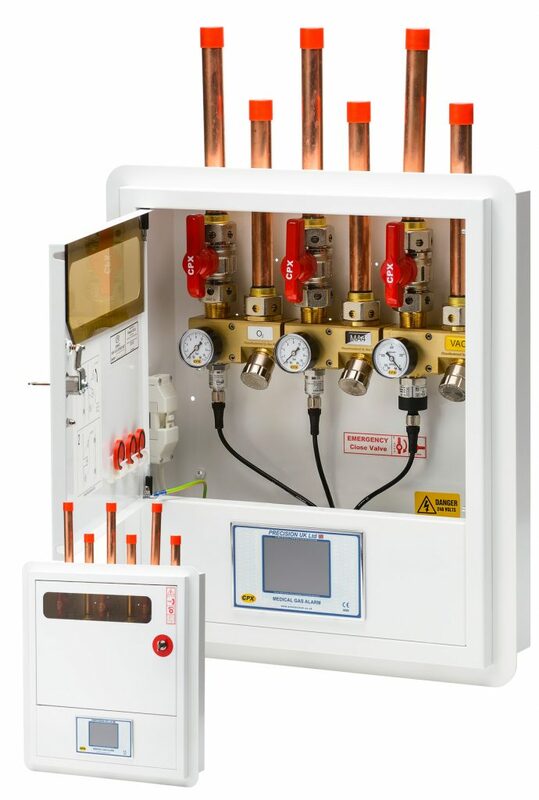 Option Flow Measurement can be connected to each individual gas type to provide flow data 24 hours each day. Flush or Surface Type fitting for 3, 4, 5 or 6 gas types available.